Background: Health benefits of probiotics have gained massive research attention recently. However, immense variations among probiotics for specific health benefits motivated the quest for efficacious probiotics, and study of discreet criteria for their selection. Comprehensive exploration of unexplored ecological niches especially indigenously fermented foods and others, may lay hands on proficient probiotics. Conventionally dairy products have been used as probiotic vehicles but lactose intolerance, high cholesterol content, allergenic milk proteins, and trend of vegetarianism motivated the search for non-dairy products such as cereals, fruits/vegetables, or others as probiotic carriers. Cereals are consumed all over the world, and fulfill the requirement of dietary fibre, proteins, energy, minerals, and vitamins, thus, may serve as excellent probiotic vehicles. 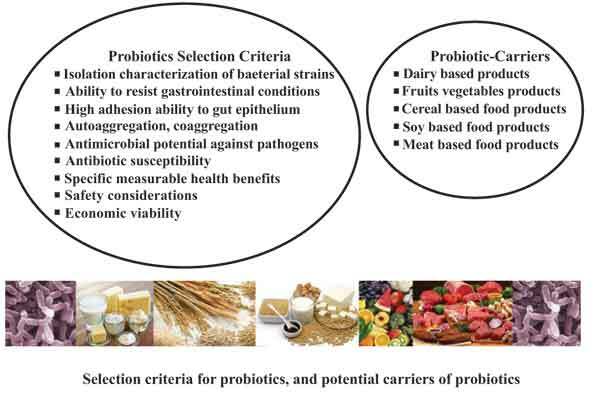 Current article presents recent developments on selection criteria of probiotics isolated from diverse sources, and assessment of potential of cereal based products as prospective carriers for probiotics. Methods: Comprehensive literature survey was done (books, journal articles, websites: http:// www.ncbi.nlm.nih.gov/pubmed; www.sciencedirect.com) for the published articles on isolation of new/efficacious probiotics from indigenously fermented foods and other sources, and their selection criteria, and on the usage of cereals as potential vehicles for probiotic delivery. The research/review articles were studied, analyzed and interpreted. Results: The published data shows that novel and relatively less explored habitats especially the indigenously fermented foods, and others are being intensively investigated, and may come up as new reservoirs for effective probiotics. Results from numerous studies indicated that cereal products have immense potential to be employed as probiotic vehicles, and may gain as much acceptance and popularity as is being enjoyed by dairy products. Conclusion: Indigenous fermented foods/and unexplored sources may help getting new effectual probiotics with prospective commercial applications. Cereal based products may offer healthier option for probiotic delivery contrary to conventional dairy products. Probiotics, functional attributes, prebiotics, cereals, probiotic-carriers. School of Biotechnology, University of Jammu, Bawe Wali Rakh, New Campus, Jammu-180006, India.